The SP465 is a self propelled mower with a Honda engine 4 stroke engine. The robust steel body has a powder coated paint finish for longevity. Operated by a single lever, the cutting height has 6 positions from 25 to 75mm. The SP465 self propelled lawnmower has power driven rear wheels which take the effort out of pushing the mower. A self propelled mower is simplicity itself to use; simply pull up the clutch lever and away you go. Let the lever go and the wheels stop - couldn't be easier! Self propelled mowers have become very popular over the last few years. Powered by the Honda GCV 135cc OHC 4 stroke engine running on unleaded petrol, this mower is very smooth, quiet and easy to start. 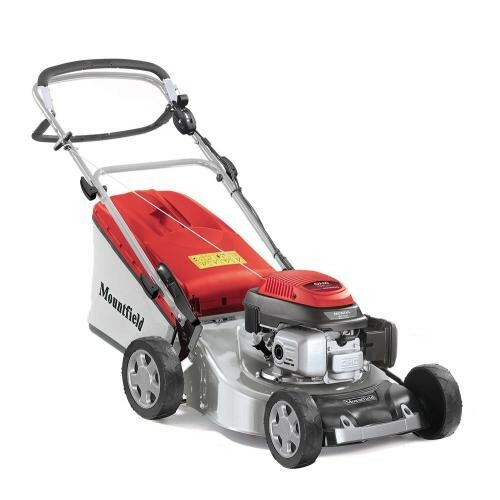 The reputation of the Honda engine is one of absolute reliability and combined with the lawn mowing experience of Mountfield we have a great machine. The chassis is powder coated steel with centralised height of cut adjustment of 6 cutting positions from 25 to 75mm. The grass collector holds 60 litres of grass. The collector lifts off the back of the mower easily for emptying and the mower can be use used without the collector if you wish to leave the cuttings. This model also has the added feature of a mulching plug. This mower is sure to give a neat and tidy finish on medium sized lawns up to 40m x 40m.